Doob was born in Cincinnati, Ohio, February 27, 1910, the son of Leo Doob and Mollie Doerfler Doob. The family moved to New York City before he was three years old. The parents felt that he was underachieving in grade school and placed him in the Ethical Culture School, from which he graduated in 1926. He then went on to Harvard where he received a BA in 1930, an MA in 1931, and a PhD (Boundary Values of Analytic Functions, advisor Joseph L. Walsh) in 1932. 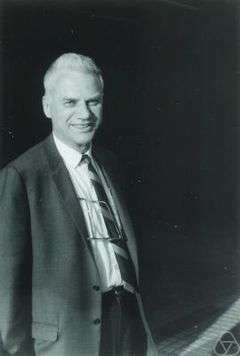 After postdoctoral research at Columbia and Princeton, he joined the Department of Mathematics of the University of Illinois in 1935 and served until his retirement in 1978. He was a member of the Urbana campus's Center for Advanced Study from its beginning in 1959. During the Second World War, he worked in Washington, D. C. and Guam as a civilian consultant to the Navy from 1942 to 1945; he was at the Institute for Advanced Study for the academic year 1941–1942  when Oswald Veblen approached him to work on mine warfare for the Navy. — (1953). Stochastic Processes. John Wiley & Sons. ISBN 0-471-52369-0. — (1984). Classical Potential Theory and Its Probabilistic Counterpart. Berlin Heidelberg New York: Springer-Verlag. ISBN 3-540-41206-9. — (1993). Measure Theory. Berlin Heidelberg New York: Springer-Verlag. J. L. Doob (1934). "Probability and statistics". Transactions of the American Mathematical Society. American Mathematical Society. 36 (4): 759–775. doi:10.2307/1989822. JSTOR 1989822. — (1957). "Conditional brownian motion and the boundary limits of harmonic functions" (PDF). Bulletin de la Société Mathématique de France. 85: 431–458. — (1959). "A non probabilistic proof of the relative Fatou theorem" (PDF). Annales de l'Institut Fourier. 9: 293–300. doi:10.5802/aif.93. — (1962). "Boundary properties of functions with finite Dirichlet integrals" (PDF). Annales de l'Institut Fourier. 12: 573–621. doi:10.5802/aif.126. — (1963). "Limites angulaires et limites fines" (PDF). Annales de l'Institut Fourier. 13 (2): 395–415. doi:10.5802/aif.152. — (1965). "Some classical function theory theorems and their modern versions" (PDF). Annales de l'Institut Fourier. 15 (1): 113–135. doi:10.5802/aif.200. — (1967). "Erratum: Some classical function theory theorems and their modern versions" (PDF). Annales de l'Institut Fourier. 17 (1): 469. doi:10.5802/aif.264. — (1973). "Boundary approach filters for analytic functions" (PDF). Annales de l'Institut Fourier. 23 (3): 187–213. doi:10.5802/aif.476. — (1975). "Stochastic process measurability conditions" (PDF). Annales de l'Institut Fourier. 25 (3–4): 163–176. doi:10.5802/aif.577.